ABOUT THIS PRESS CONFERENCE: The Beatles North American tour traveled onward from Seattle Washington to Vancouver Canada, arriving in the early hours of August 22nd. 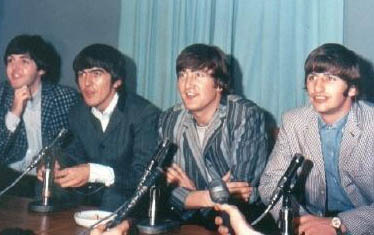 The group gave the following press conference just before their performance at Vancouver's Empire Stadium. According to Allan Fotheringham's report in Maclean's magazine: "The Beatles press conference has become as memorable an institution as President Roosevelt's fireside chats; and at the Vancouver session, Paul, John, George and Ringo were at their flippant best. Eighty-nine newsmen crowded into a room designed for forty... After the long buildup, the performance itself was no anti-climax." From here, the tour departed for Los Angeles for the group's historic 1964 concert at the Hollywood Bowl. Q: "We heard reports that, maybe, the plane was late and they wouldn't let them into Canada. Why?" JOHN: "Because of the hair. Have to be deloused before you can get in." JOHN: (jokingly) "Well, it's a thought, Paul. It's just a thought." PAUL: (giggles) "It's a thought, John." Q: "What held you up on your way here? Why wouldn't they let you into Canada? Seriously." GEORGE: "'Cuz the pilot didn't have a little stamp on his bit of paper." JOHN: "We got here and... had to go back." PAUL: "There was one little thing missing on the paper." Q: "That happened while you were in the air over Vancouver?" GEORGE: "We were almost here, and he turned 'round... went back... got a little thing stamped on his passport, and then..."
JOHN: "And we had MORE chicken sandwiches." GEORGE: "And then we came again. And then the police took us for a forty minute tour of the... of the city." JOHN: "Because they weren't ready here." PAUL: "There was something not ready, you know." GEORGE: "Apart from that we were on time." Q: "How did you like it?" JOHN: "Very good. Only we were starving, you know." Q: "On a percentage basis these days, what are you taking out of America compared with Britain, in earning power?" JOHN: "I haven't a clue." PAUL: "Definitely. No we don't know how much, you know. Really." JOHN: (jokingly) "Do you get more in America?" PAUL: "You won't believe us, but..."
JOHN: "I figure we get more here, 'cuz it's so far away from home." Q: "There's a rumor you own a bank in England. Is that correct?" JOHN: "No, we just borrow it now and then." Q: "What's your deal with..."
PAUL: "Just gettin' it clear, John." Q: "What is your deal with EMI which, of course, is Capitol Records?" Q: "Is it a long-term contract, and if so, how long?" PAUL: "No, it actually, I think it expires next year." JOHN: (at same time as Paul) "I think it expires next year or something like that." GEORGE: "It expires any year now." Q: "Will you remain with them?" JOHN: "Depends what they say." Q: "Oh, you'll buy them." Q: "What are your plans for movies?" PAUL: "We've got to do a new one in February. Februar-ar-ary. There aren't... we haven't made any plans for it as yet. We talked to the director." GEORGE: "No title, no script." RINGO: (jokingly) "No script-- No actors." Q: "Are you gonna do any more (vocal) solos, Ringo, on any future records?" RINGO: "Umm... I suppose so, you know." Q: "When are you going to retire, fellas?" Q: "In a past interview, you once said that you didn't mind being in the spotlight twenty-four hours a day. Isn't there the odd time that you do enjoy doing common things, and just having it all to yourself?" JOHN: (giggles) "I don't know." Q: "Are you going to immigrate to the States, fellas?" GEORGE: "'Cuz we like England." Q: "Who are your favourite recording artists?" JOHN: "Uh, Little Richard's one." RINGO: "Marvin Gaye, Mary Wells, The Exciters." Q: "When you people were initially starting did The Crickets have any influence in your sound at all?" JOHN: "When they were with Buddy Holly, yeah." Q: "How about the name, did that have any influence? --The Crickets and The Beatles?" JOHN: "Can't remember, it could've. You know, it's so long ago." Q: "What's the most unusual request you've ever had from a fan?" JOHN: "Well, I wouldn't like to say, really!" Q: "Are you fellas identified with either the mods or the rockers?" JOHN: "Uh... well, the rockers think we're mods, and then the mods think we're rockers, I think." Q: "Do you enjoy beating off girls?" JOHN: "We don't do it, the police do it." Q: "Do you feel safe riding in an airplane?" JOHN: "Not really. As safe as you can be in an airplane, I suppose." Q: "Are you going to write another book, John?" Q: "When is it coming out?" JOHN: "I don't know. I can't seem to be able to..."
Q: "What are you going to call it?" JOHN: "I don't know that either." Q: "Does every city look the same?" JOHN: "No. Some have trees, some don't." Q: "What are your plans for the next ten years?" JOHN: (in a deep voice) "What are your plans, son?" RINGO: (in elderly voice) "Can you speak up, please!" RINGO: "I haven't planned anything. I just keep going, you know... see what happens. It's more fun." Q: "Ringo, are you engaged to Maureen Cox?" Q: "Are you going to be?" Q: "Do you think overexposure with movies and too many record releases perhaps could damage your career at all?" JOHN: "We don't release any more records than anybody else, it just so happens..."
RINGO: "We've only made one movie." JOHN: "...they make everything we make into a single over here." PAUL: "In fact, we... we..."
JOHN: (interrupting Paul) "We've made three albums." JOHN: "Tell him... sorry, Paul." GEORGE: (interrupting Paul) "In England, we made three albums!" GEORGE: "And they've got seven out over here, or about seven." RINGO: "So work that out for yourselves." JOHN: "They just make 'em up." PAUL: "In fact, we've made less records than most people. So there. We've only made... I think we've only ever made seven singles, and it seems to me like thousands, you know." JOHN: "Seven singles and three albums." Q: "Over here, we get one every day." PAUL: "Well, we only made seven, you know." Q: "I notice none of you smoke, do you have any drinking habits?" JOHN: (shows cigarettes) "What's this?" JOHN: "It's not peanuts, you know! Ha ha ha!" PAUL: "We drink. Drink, too." Q: "How many of the quartet are the original Beatles?" JOHN: "The three of us." Q: "Who was the boy that was ahead of..."
PAUL: "A fella called Pete Best." RINGO: "I'm the one that died." Q: "Why did he quit?" JOHN: "We threw him out." PAUL: "He really was... It's one of those things, you know. Recording manager said he wasn't..."
Q: "How long does your show last?" PAUL: "Just a bit over thirty, yeah." Q: "What's worse... facing the kids or a mob like this?" PAUL: "No, it's... We enjoy it, you know. This, even." Q: "Has the press been unkind to you at any time, do you feel?" GEORGE: "The majority have been good." PAUL: "Movie-type magazines and secrets and 'The Truth Behind The Rumors,' and all that." Q: "You don't have any secrets?" PAUL: "Yeah, you know. But they're not the ones that get into the magazines, anyway." Q: "Do you feel responsible for making Britannia rule the airwaves?" PAUL: "Ooh. Ohh. You worked that one out, didn't you?" Q: "What is the best city you've ever played?" RINGO: "It's impossible, you know." PAUL: "Actually, one of the wildest audiences was, I think, Glasgow." Q: "With all the money you make, is it true you had 19-cent hamburgers from Kings for dinner tonight?" Q: "Paul, did you bring along your dad?" PAUL: "No. Well, actually my dad's having a better time than I am. He's got a... he's got a house, a race horse. He's just been for a week in Athens. I wish I was him." Q: "How much time-off do you get in a year?" JOHN: "We get good enough holidays, when we get 'em." PAUL: "Three or four weeks a year." Q: "How can you enjoy them, when I hear that in Hawaii you had to leave after just a few days?" JOHN: "We weren't going to Hawaii, we were just passing through, you see." GEORGE: "We only stayed there the night on the way to Tahiti." Q: "Did you like it?" GEORGE: "But we were only staying there the night on the way to Tahiti." PAUL: "Say it again, George." Q: "Have any of the political parties in England tried to carry favor with you and use you for their own benefit?" JOHN: "No. They all give us a mention just in case." GEORGE: "We had our pictures taken with Bessie Braddock and Harold Wilson, though." PAUL: "Yeah, but we don't know enough about politics to support one or the other, you know." Q: "You're all Torries, is that correct?" JOHN: (jokingly) "Whoever gives us the most money, you know. We vote for them." Q: "Do you date any of your teenage fans?" PAUL: "Yeah, whenever we get the chance, but you don't often get the chance to. But we do, you know." Q: "Will you be able to here in Vancouver?" PAUL: "I doubt it. No." Q: "What do you do with all the stuff that gets sent to the rooms?" PAUL: "We try to keep as much of it as we can, but we can't always keep it. So a thing like a big cake we sent to a hospital or something, because we can't carry cakes around with us, you know." Q: "How many people do the Beatles employ, as a group? The organization, The Beatles, Limited?" PAUL: "Oh, us? I don't know, you see, because much of the people that work with us..."
GEORGE: "I think 'we' only employ about two people." PAUL: "Most of the people that work with us work for 'NEMS,' which is our manager's company." GEORGE: "We employ two, and that's it." PAUL: "And they have artists like Gerry and the Pacemakers, Cilla Black, and alot of other people, you know... Billy J. Kramer." JOHN: "We have two permanently with us. One press agent and one road manager... Oh no, and a heavy." PAUL: "There he is. This one-- with the mic." Q: "You do carry a bodyguard, then?" JOHN: "You don't need to with all those police!" Q: "Do you find that you're losing your popularity in England?" JOHN: "No, not according to record sales." Q: "Then it's all just rumors?" PAUL: "Yeah. Actually, we heard before..."
JOHN: "They've been knocking us off since the third record." PAUL: "...before we went to Liverpool last time, for the Northern Premiere of the film, you know, we'd been down in London alot, because we'd been doing the film and TV and things, and everybody was saying, 'I've just been up to Liverpool, and they hate you up there, and it's terrible. Nobody likes you anymore.' And we believed 'em, you know, 'cuz we read the paper, same as anyone else. And we went up there, and it was the most ridiculous reception we've had anywhere, you know. So I give-in believing these rumors." Q: "Can I ask you if you've ever had a press reception in a more uncomfortable room?" Q: "How do you feel being compared to Dave Clark Five?" JOHN: "We're compared to everybody." Q: "How about your horse, how's it doing... your race horse." PAUL: "Great! The first time out... It's not mine, it's my dad's, you know. It's nothing to do with me. First time out it came second, and the last time out it won." JOHN: "And then it died." Q: "Does this mob of police protection come out of your take, or is the management here to accept responsibility for paying them?" JOHN: "I don't know who pays 'em, but we don't." PAUL: "The last place we played at, it was the management of the place. I don't know, it may be the same now." GEORGE: "But we just tour, we don't do all that." Q: "You'd miss them, though." JOHN: "Yeah. Well I mean, if we can't get in a place, we can't go, can we? It's the promoter's money." Q: "How long will you be on the road before you go home?" PAUL: "About four more weeks." Q: "What is the best group of teenagers, well-behaved, you've ever had?" PAUL: "Um... I don't know. They're about the same all over the world. Just got different accents." Q: "What city have you had your worst time in?" PAUL: "Don't know, because, you know... things that some people think are the worst time, we think are the best, you know. But I can't remember a worst time." Q: "You've been roughed-up and jostled in various places you've been. Can you think of one in particular that was worse than the others?" PAUL: "No, you know. Not..."
JOHN: "We've not been really roughed at all, you know." Q: "Where do you think the biggest reception crowd has been?" JOHN: "Biggest crowd was Liverpool." JOHN: "Just more than the other..."
Q: "Sydney was the biggest, wasn't it?" PAUL: "I don't know, but there was alot in Liverpool." Q: "How long did it take you to make your movie?" JOHN: "Eight weeks, was it?" JOHN: "They were trying to make it in three, but we argued." Q: "Do you like the movie?" PAUL: "It's good, you know." Q: "How's it doing where it's showing, do you know?" JOHN: "It's breaking records, I've heard. I don't want to brag." Q: "Is it true that some of your birthday mail went in the fire and you didn't even see it?" GEORGE: "No, untrue. Well, I think so. Actually, it was, umm..."
PAUL: "I don't think that was the rumor anyway, you know." JOHN: "The rumor was it went in the bin. By the time it gets over here, it's on fire." PAUL: "Some people found some mail... and I think it was about two letters out of thousands, you know... which had been unopened. They'd been sent to the fan clubs, and the fan club was supposed to open and read 'em and then throw 'em. And there were about two that they'd forgotten to open, so this was a great big scandal, you know. It was just a slip-up." Q: "Ringo, do your families see your shows when you are in England?" RINGO: "Sometimes, when we play Liverpool and 'round about there. We did the premiere in London, they came down there. They come down and I go up."